It’s just what it sounds like: the water is flowing in the opposite direction from its normal flow. With the direction of flow reversed, due to a change in pressures, backflow can allow contaminants to enter our drinking water system through cross-connections. There are two types of backflow… backpressure backflow and Backsiphonage. Backpressure backflow is backflow caused by a downstream pressure that is greater than the upstream or supply pressure in a public water system or consumer’s potable water system. Backpressure (i.e., downstream pressure that is greater than the potable water supply pressure) can result from an increase in downstream pressure, a reduction in the potable water supply pressure, or a combination of both. Increases in downstream pressure can be created by pumps, temperature increases in boilers, etc. Reductions in potable water supply pressure occur whenever the amount of water being used exceeds the amount of water being supplied, such as during water line flushing, fire fighting, or breaks in water mains. Backsiphonage is backflow caused by a negative pressure (i.e., a vacuum ~ or partial vacuum) in a Public water system or consumer’s potable water system. The effect is similar to drinking water through a straw. Backsiphonage can occur when there is a stoppage of water supply due to nearby fire fighting, a break in a water main, etc. A backflow preventer is a means or mechanism to prevent backflow. 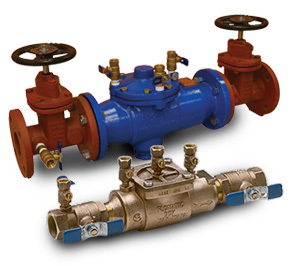 The basic means of preventing backflow is an air gap, which either eliminates a cross-connection or provides a barrier to backflow. The basic mechanism for preventing backflow is a mechanical backflow preventer, which provides a physical barrier to backflow. The principal types of mechanical backflow preventer are the reduced-pressure principle assembly, the pressure vacuum breaker assembly, and the double ch eck valve assembly. A secondary type of mechanical backflow preventer is the residential dual check valve. What does a typical cross connection look like? One example is the common garden hose attached to a wall hydrant or spigot with the other end of the hose lying in a pool, puddle or other source of non-potable water. Another might be the potable water make-up line that feeds a hot water heating boiler. These systems contain rusty, oil saturated heating water, which would pose a threat to health if consumed. Why must I test this Backflow Preventer Annually? There are a variety of minerals and impurities in our drinking water which may pose no health risk, but which can corrode and scale the valves and other fittings in a water distribution system. 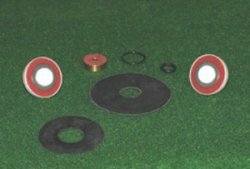 Mechanical backflow preventers have internal seals, springs, and moving parts that are subject to fouling, wear, or fatigue and therefore must be tested regularly to ensure safe and proper operation. A device that is installed but not functioning creates a false sense of security for the water customer. These are new internal parts from a Backflow Assembly. 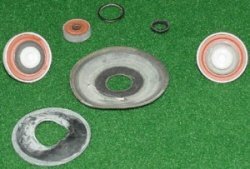 These are parts from a used Backflow Assembly. Like any mechanical object, parts are subject to failure over time. 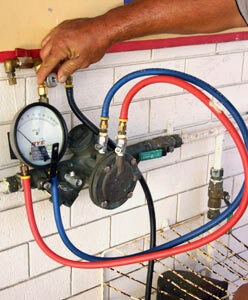 to determine the degree of protection againstbackflow that is present in today’s homes. 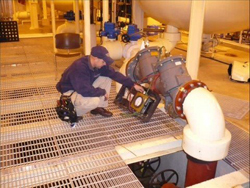 Periodic on-site inspections of your facility are a vital part of your cross-connection control program, as they are essential in maintaining compliance with State and Local regulations, as well as OSHA regulations that mandate a safe, hazard-free working environment. Indiana requires that most Backflow Assemblies be tested annually. Certain devices must be tested every 6 months. SOS Backflow is certified by the State of Indiana to test all Backflow Assemblies, commercial and residential. When you become a SOS Backflow customer, we do our best to make things easy for you. We maintain record keeping details about your Backflow Assembly, such as Manufacturer, size, location, and serial number. This way, in the event of any emergency, you don’t need to waste time locating these details. We also keep records of the due date of your next inspection. 30 days before your Backflow Assembly is due for inspection, SOS will contact you to schedule your appointment to ensure your compliance with state requirements. Any needed repairs are additional and will be priced prior to work being completed. Any detector device is invoiced for each device and is not priced as a single unit. Discounts may be available for mulitple devices to be tested at the same time. Please call to check. If we come out to the property to test the device and it fails you are still responsible for the cost of the service.